A glowy purple shimmer, the most beautiful bright purple of all. Opi Suzi And the 7 Dusseldorfs nail polish is part of the classic range. Exclusive ProWide brush for smooth, even coverage. 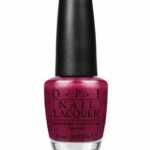 All OPI Nail Lacquer contains no DBP, toluene, or formaldehyde.